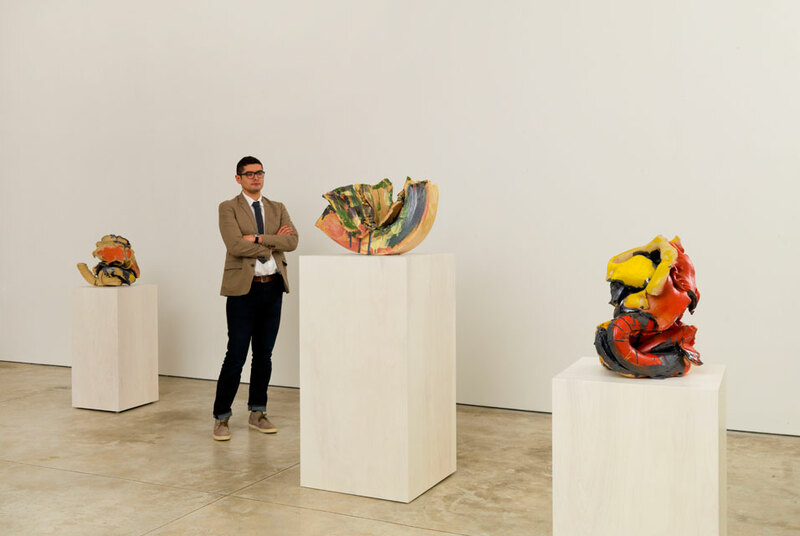 Exhibition of new ceramic works by Lynda Benglis opens at Cheim & Read in New York Installation view. Photo: Courtesy Cheim & Read, New York. NEW YORK, NY.- Cheim & Read announces an exhibition of new ceramic works by Lynda Benglis. Born in Lake Charles, Louisiana in 1941, Lynda Benglis moved to New York City in the late 60s. Her early, ground-breaking work – landscape-like, sculptural installations of poured polyurethane foam and latex – confronted the then-current, male-dominated tropes of Minimalism with brightly-colored, biomorphic forms which embraced themes of ambiguity, femininity, nature and transformation. Their formal ambiguity resisted easy definition: Benglis has long critiqued the art world’s attempt at classifications and hierarchies, as well as societal boundaries of sexuality and gender. Simultaneously seductive and grotesque, Benglis’s work has always been the result of a fluid and organic working process, in which difficult-to-control materials help determine the final outcome. Her ceramic sculptures, though more intimate in scale, are also constructed with deference to the medium’s inherent characteristics. While the clay works accentuate issues she has addressed throughout her career – the blurring of distinctions between pliable and rigid, accidental and intentional, form and shapelessness – they also expand the scope of her artistic methods, engaging notions of craft, functionality, and primeval history. Benglis had experimented with clay as a student in the early 1960s, but didn’t pursue it as a medium until the early 1990s. Her newest work, made in New Mexico, retain the earthy, elemental, primal nature of clay, and highlight the material’s unique susceptibility to the artist’s touch: clay easily preserves the physical impressions of the hands which mold it. Benglis does not use a potter’s wheel, but hand-builds with tubes and slabs of clay, pinching, stacking, squeezing, pulling and smoothing them into complex sculptural compositions. Sometimes wave-like and lyrical, sometimes squat and spherical, Benglis’s ceramics explore various manifestations, excavations and manipulations of form. She collapses the boundaries between interior and exterior space, using both hollowed out and compacted elements which collide and fuse together reinforcing the sexual undercurrents of her muscular, polymorphic shapes. Benglis’s ceramics condense the full-bodied gesture of her earlier work into the more focused expressions of her hands. As with her other work, color becomes an equally important component. Benglis’s glazes – pinks and mauves, earthy greens, blacks, ochres, and blues – are oozed, dripped, brushed and poured on, coalescing in some areas and avoiding others, providing texture and variability to the already tactile, unglazed surface of the clay. Benglis’s painterly application of glaze re-contextualizes her forms, as if they were not sculptural, but paintings in three-dimensional, physical space. Again, ambiguity and transformation remain at the core of her practice. Benglis’s creative process is evident in her works’ final realization: one imagines its physical making and thus identifies with the intensity and focus of her artistic methodology. Lynda Benglis resides in New York and Santa Fe, New Mexico. Her work is in important public collections, and has been exhibited extensively. Benglis was the subject of a 2010-11 international retrospective which traveled to The Irish Museum of Modern Art, Dublin; The Van Abbemuseum, Eindhoven; Le Consortium, Dijon; New Museum, New York; and the Museum of Contemporary Art, Los Angeles.